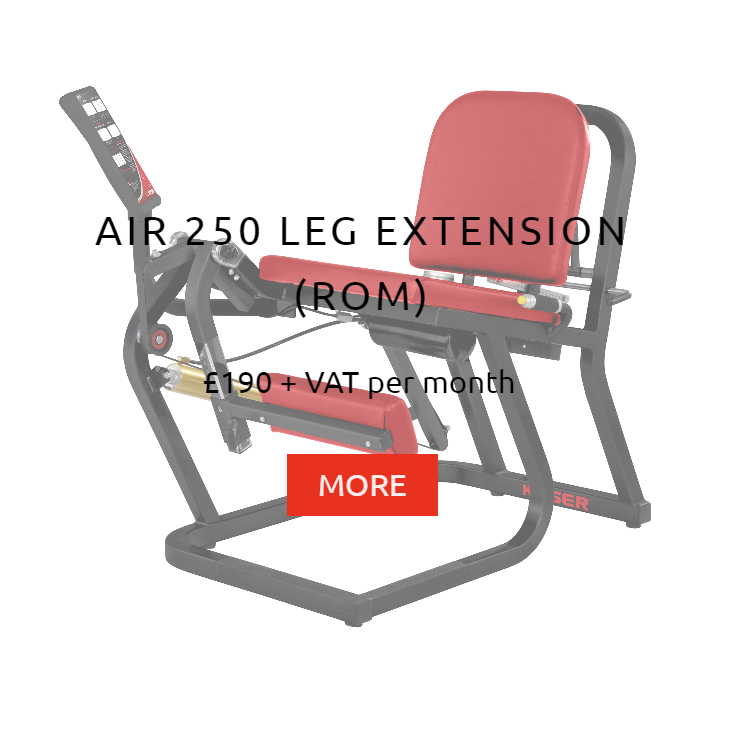 In association with Rent Gym Equipment Ltd.
We supply the equipment that gives you the edge over the competition. 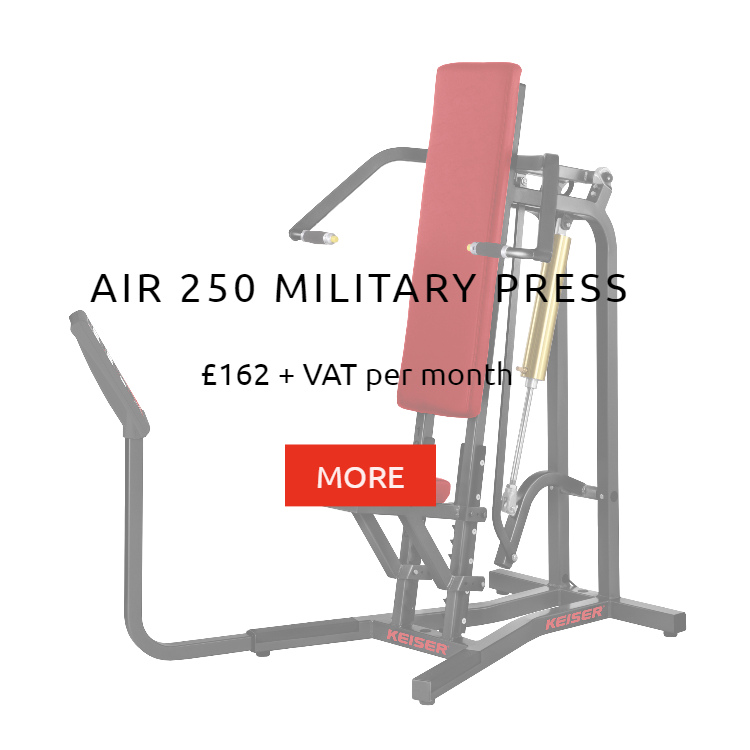 Our ‘choice’ selection of kit makes your functional fitness training areas, extraordinary. 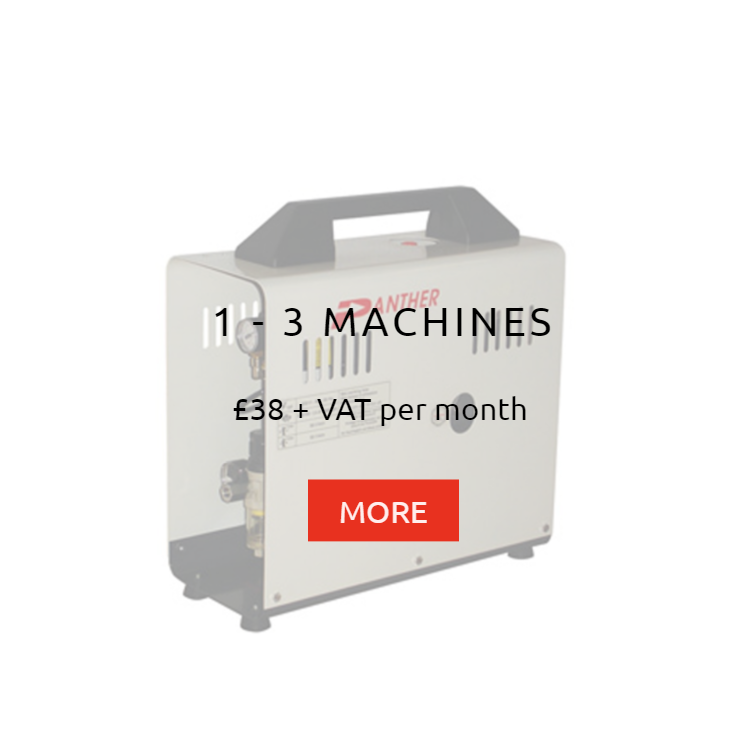 Our monthly rental prices allow access to some of the most desirable, premium and effective equipment in the market, with no lengthy credit checks. 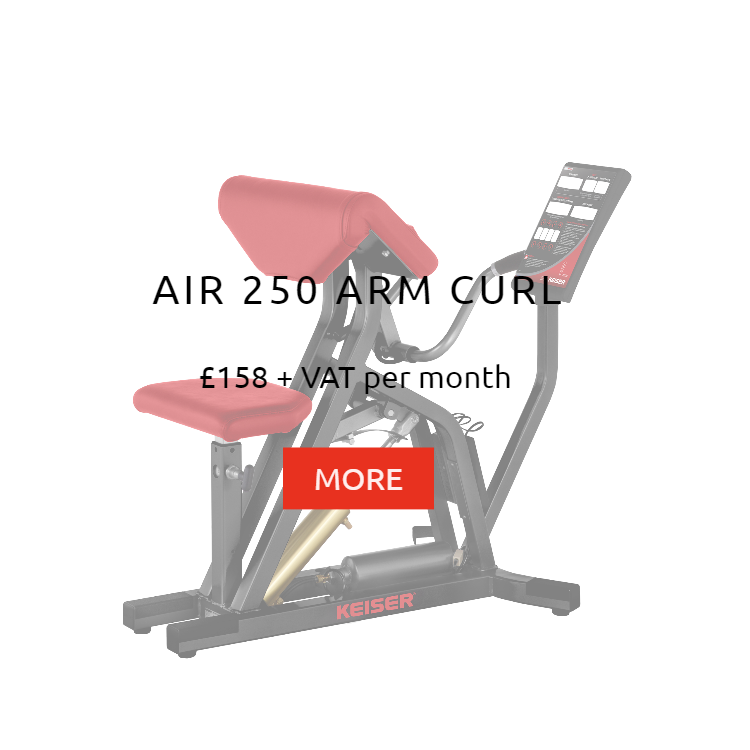 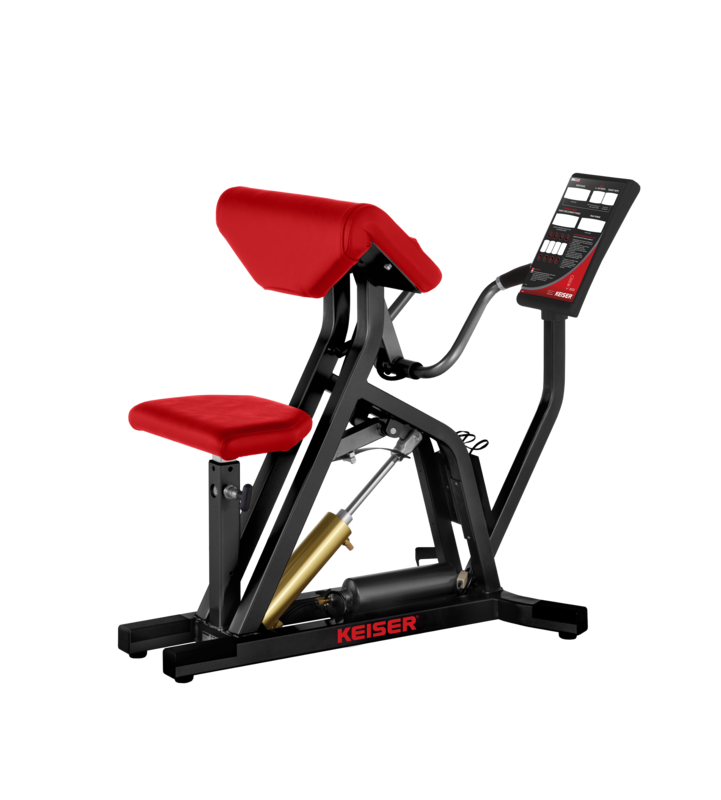 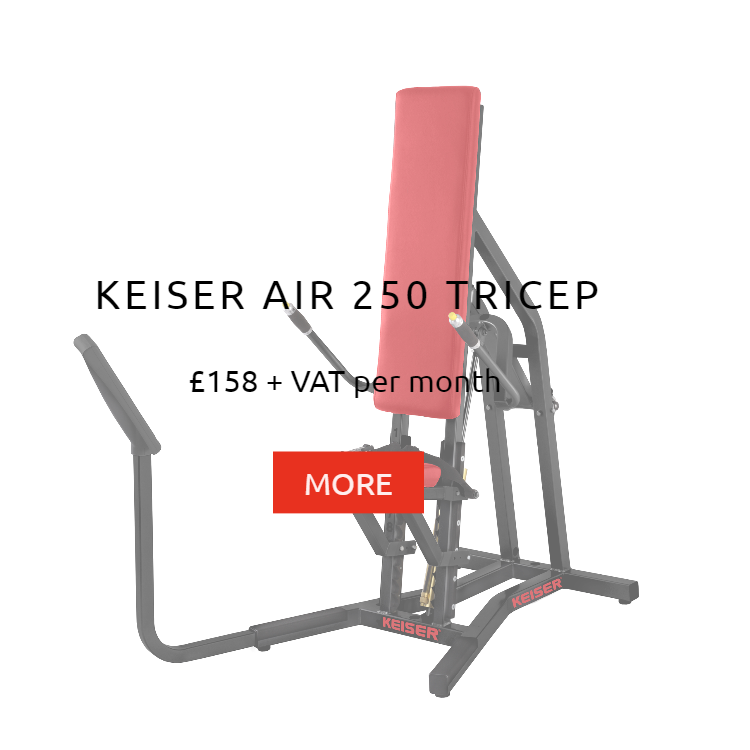 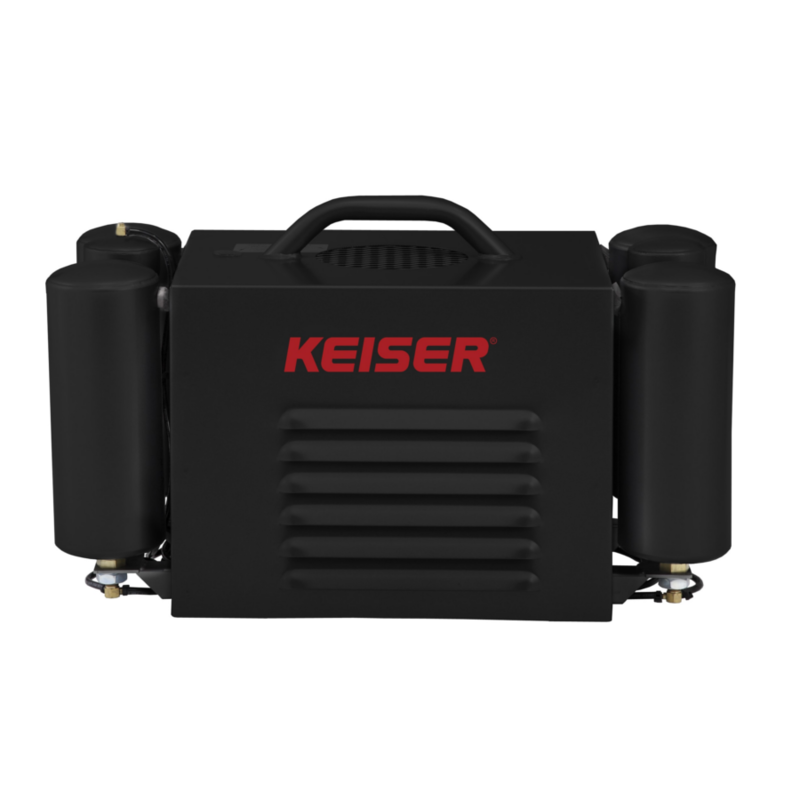 Each of the Keiser monthly rental prices below includes a compressor (the Functional Trainer prices include their accessory pack too.) 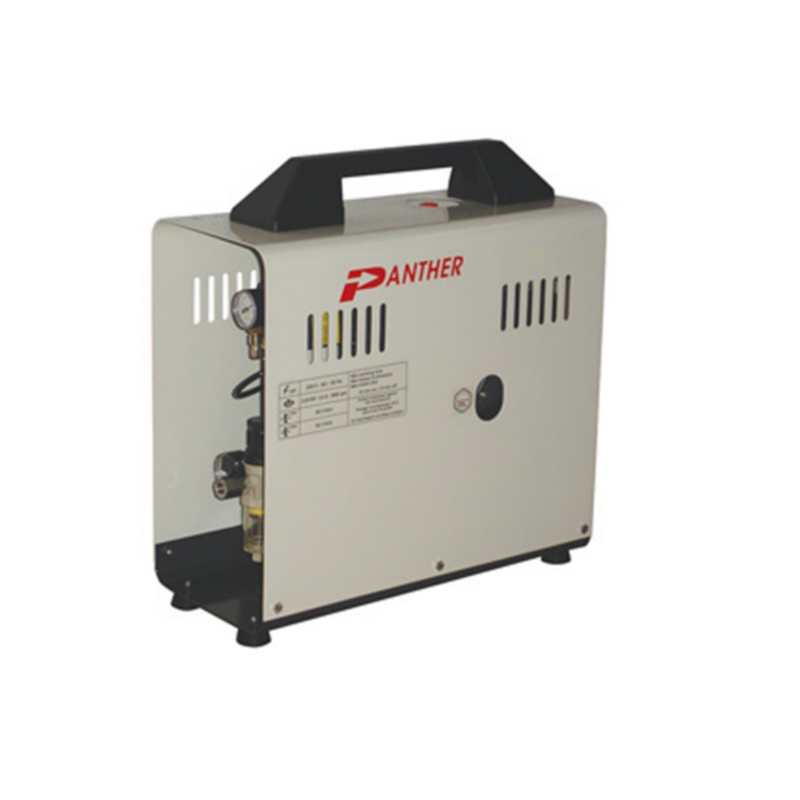 However, you don’t need one compressor per machine! 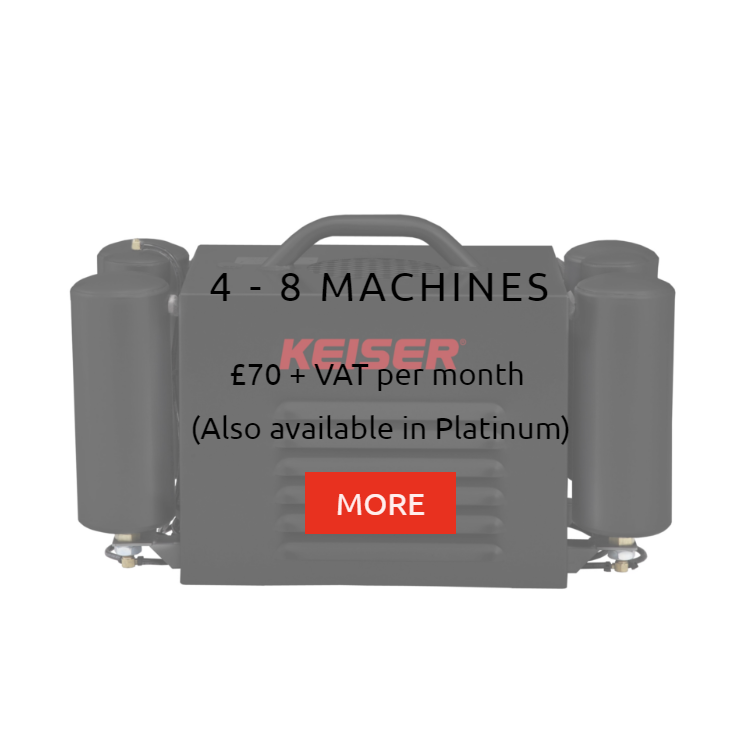 If you already have a compressor or you’re looking for more than one piece of Keiser in your facility, then we can save you money. 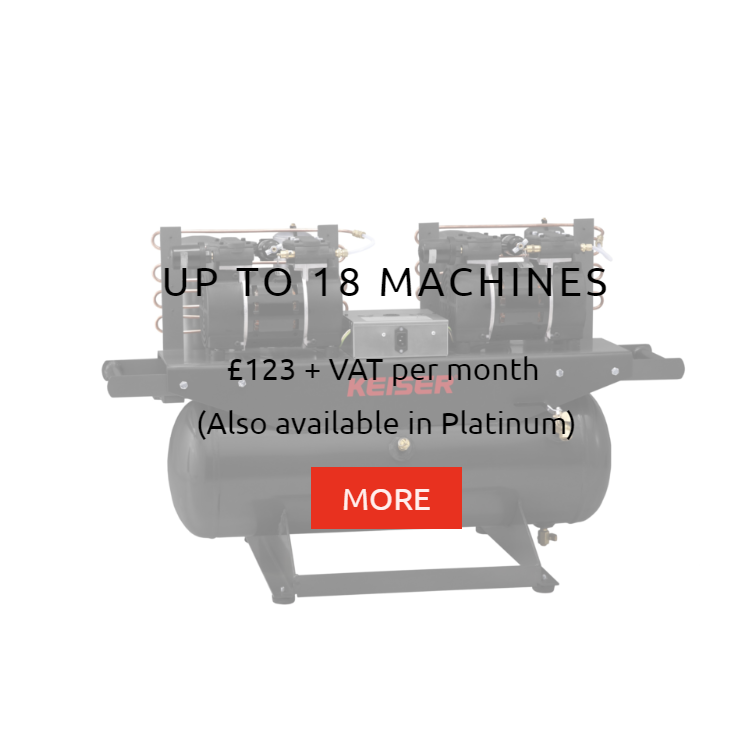 Just let us know what your seeking to achieve and we will specify your compressor requirements and provide you with a quote that’s best for you. 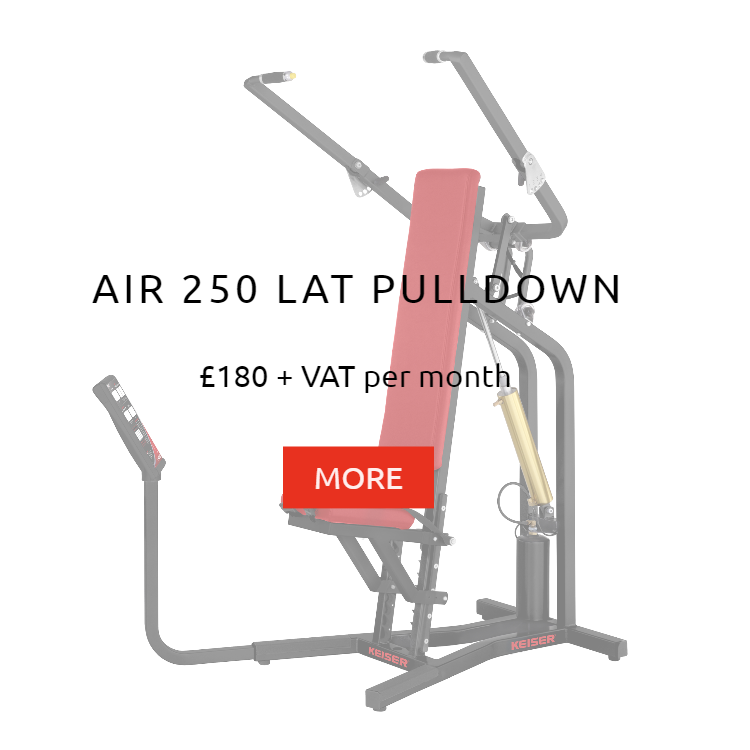 We will work hard to get your monthly rental price down! 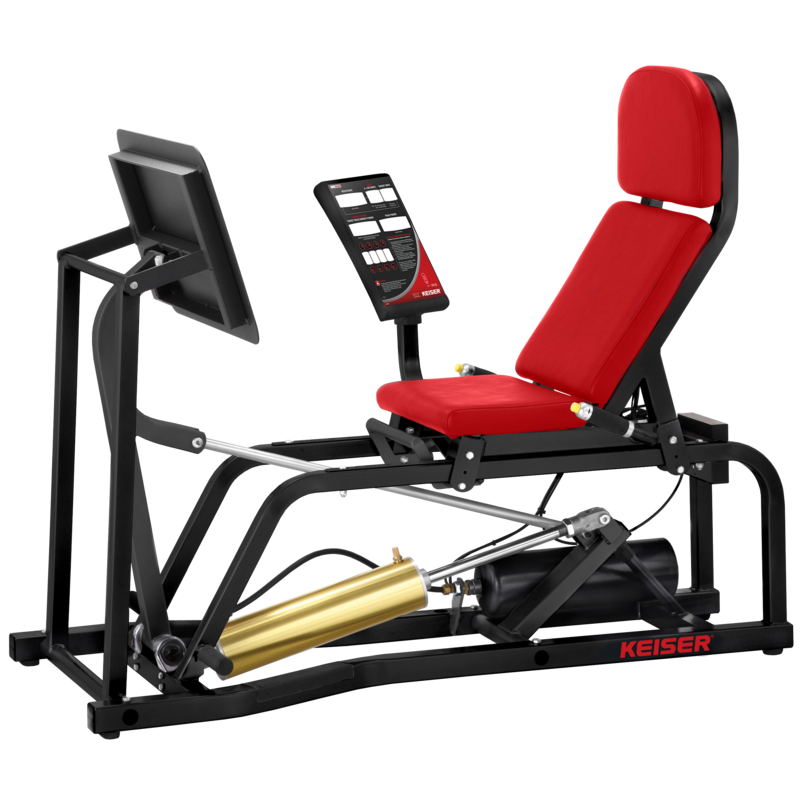 All Keiser equipment comes with an annual service and a 4 year parts and labour warranty (ex wear parts). 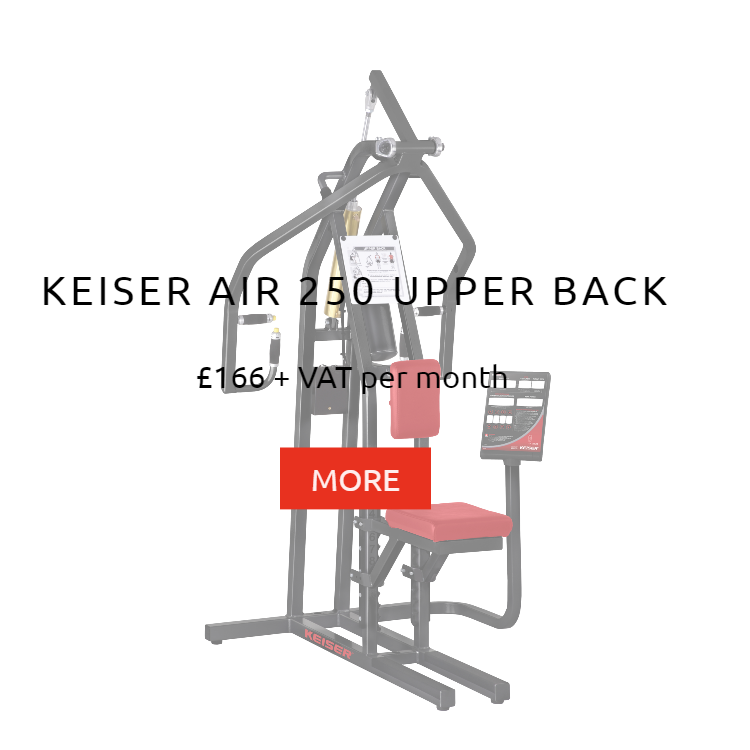 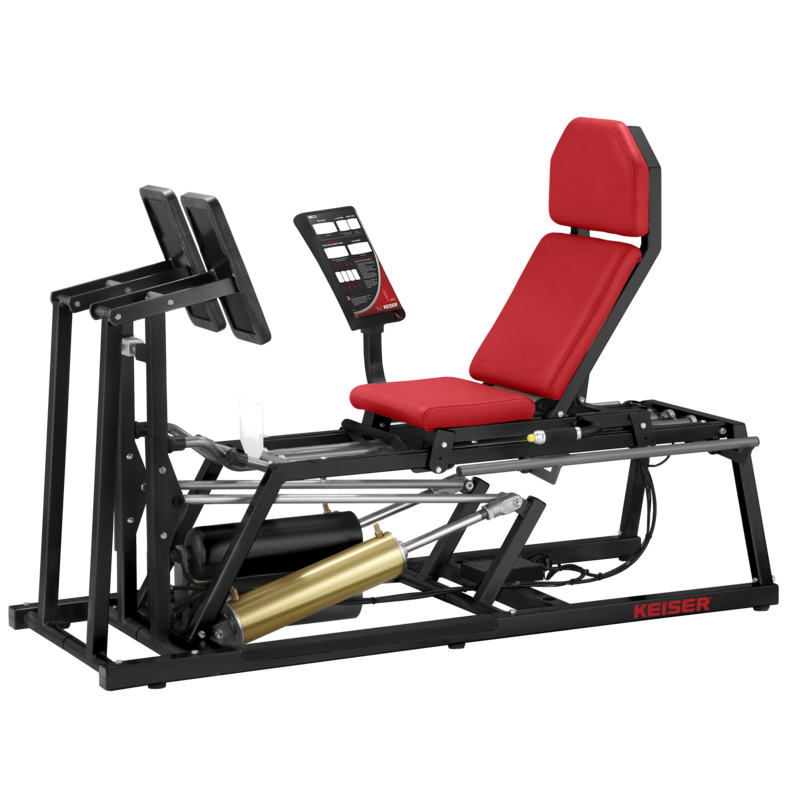 Keiser uses pneumatics (NOT to be confused with hydraulics) powered by air compression. 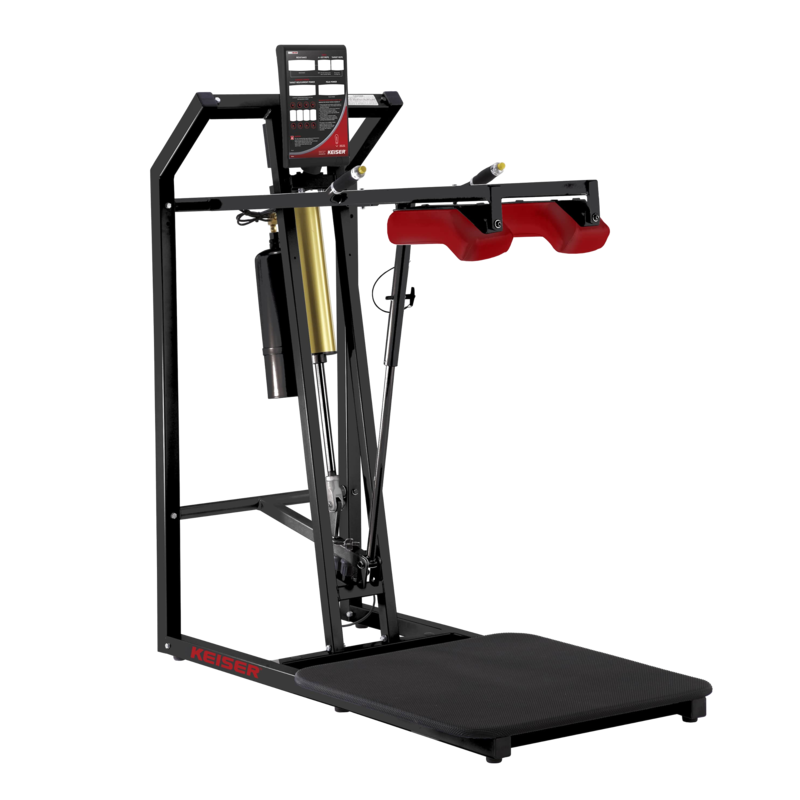 This genius allows for 5 different kinds of training such as power, training at speed, heavy negative training, strength and conditioning and HIT. 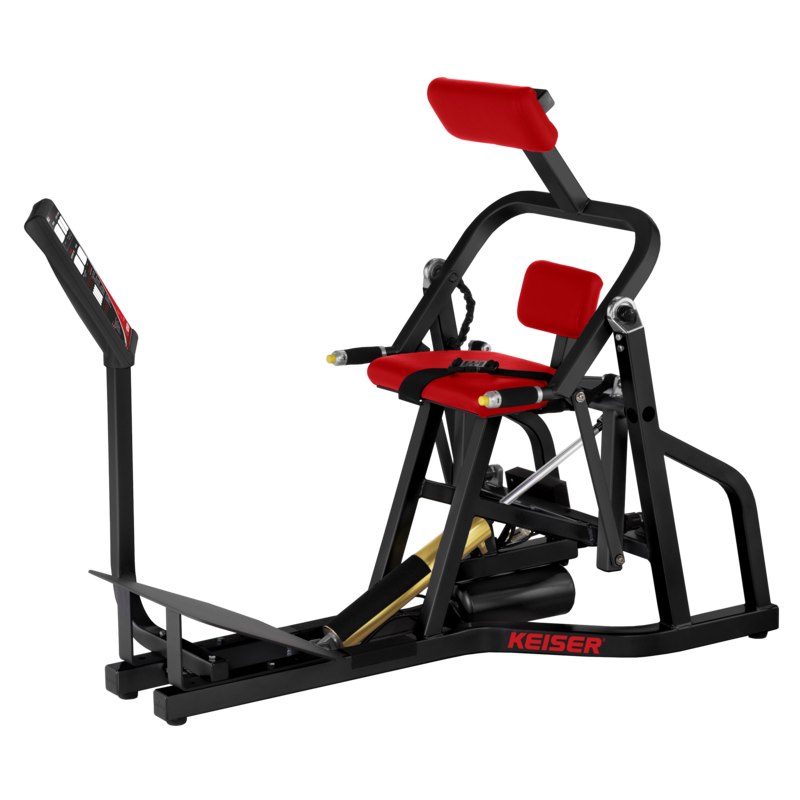 Coaches, premier teams, athletes, PT’s and fitness facilities across the world use Keiser because it delivers results. 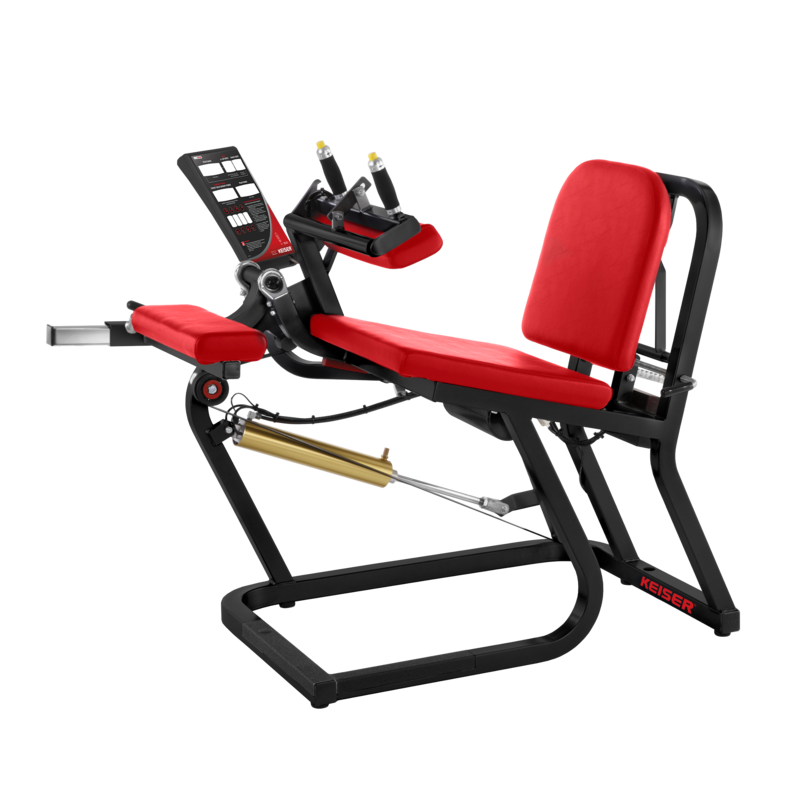 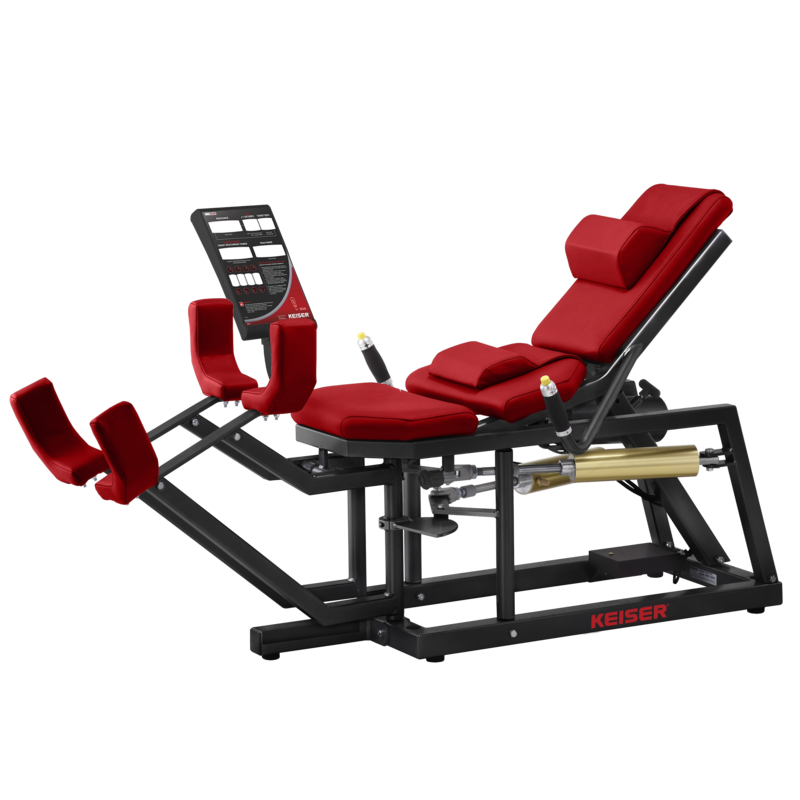 Our section of fitness equipment for distribution is based on quality, service and their potential to deliver the best results in both business and in fitness. 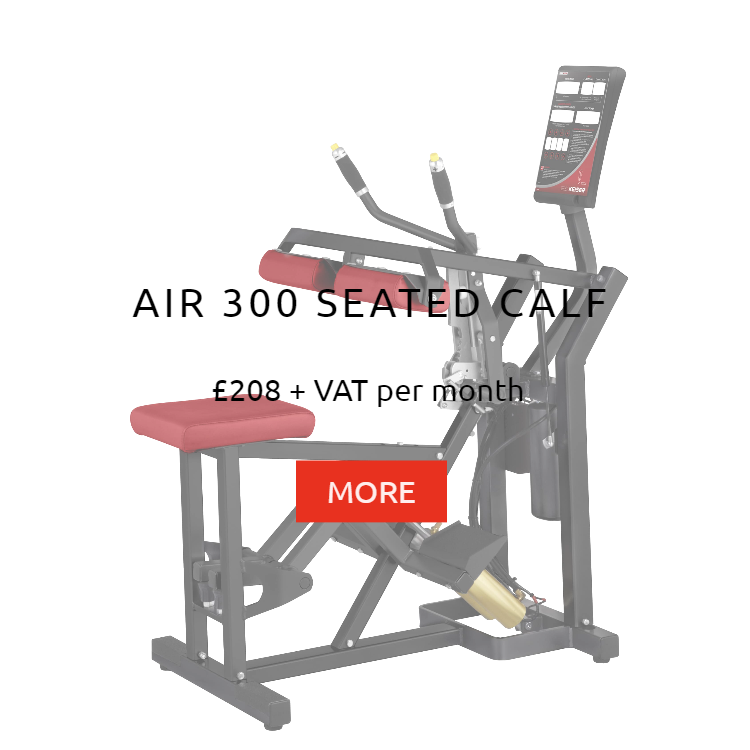 We have removed the biggest barrier to its’ ownership; the price. 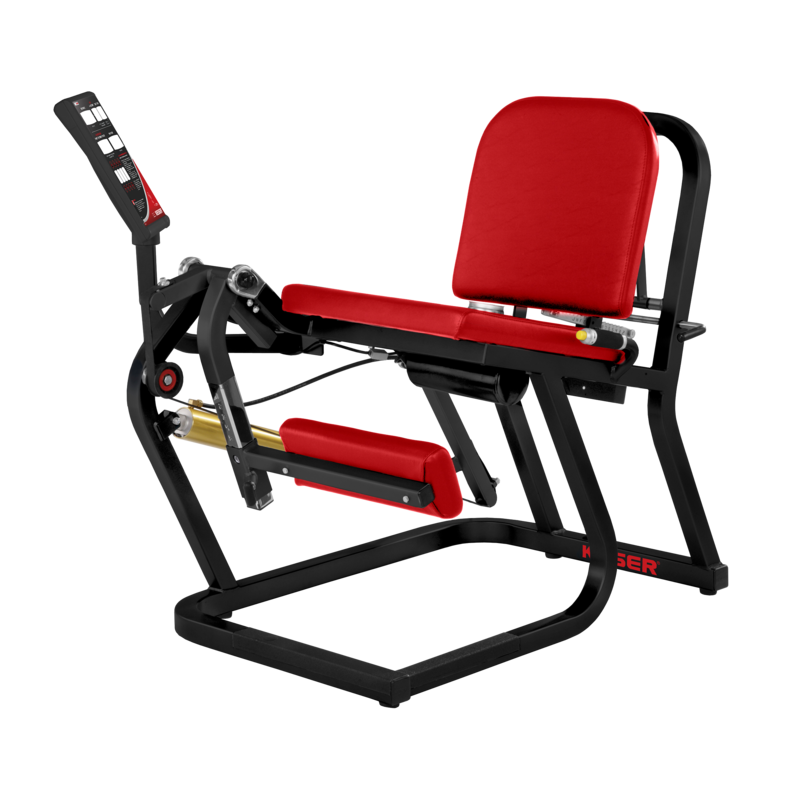 We select equipment that is beautifully designed, extraordinarily effective, incredibly versatile, safe to use and virtually indestructible. 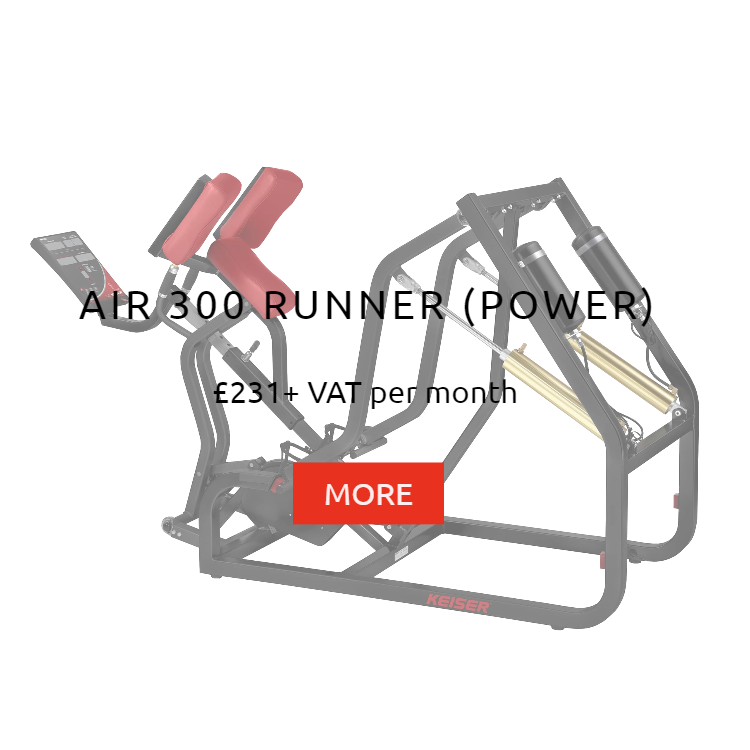 So renting it just makes sense. 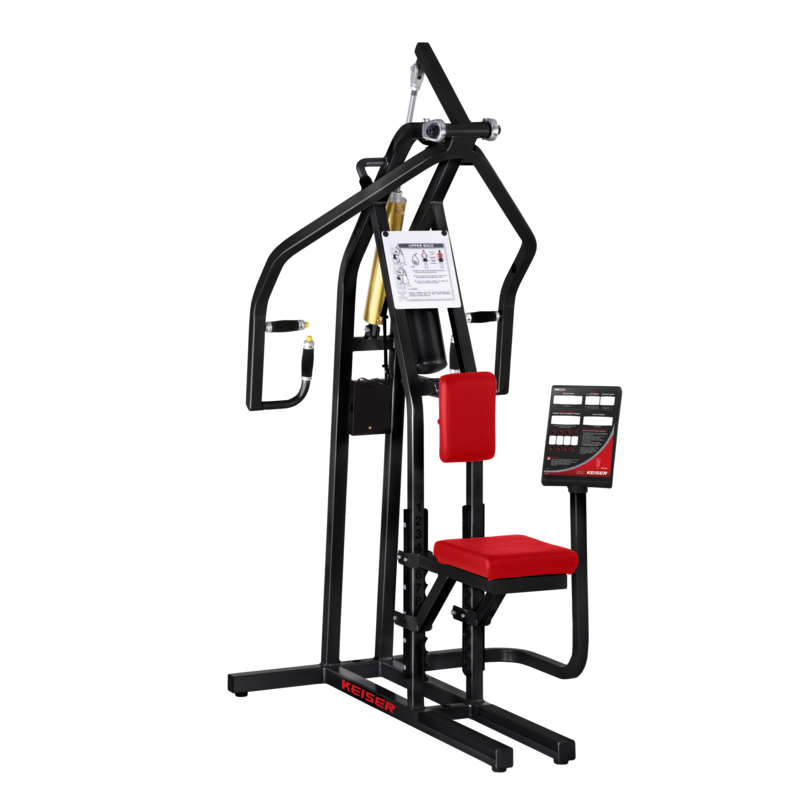 The 4 year parts and labour warranty (ex wear items) gives peace of mind that your rented fitness equipment will last for the duration. 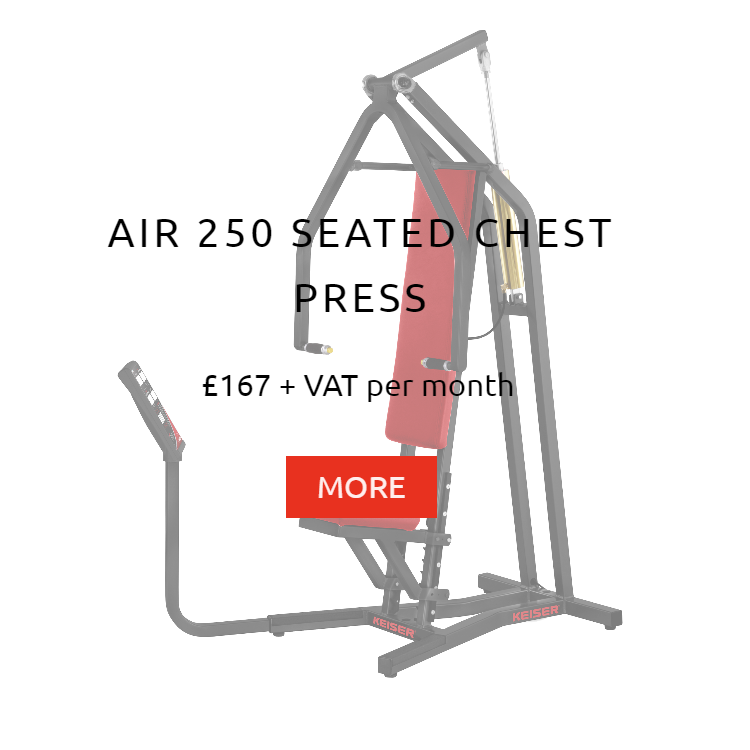 Our agreement with Rent Gym Equipment Ltd. has removed that price barrier. With low monthly costs and no credit checks to set up, renting a your fitness equipment for that special fitness area in your gym has never been easier. 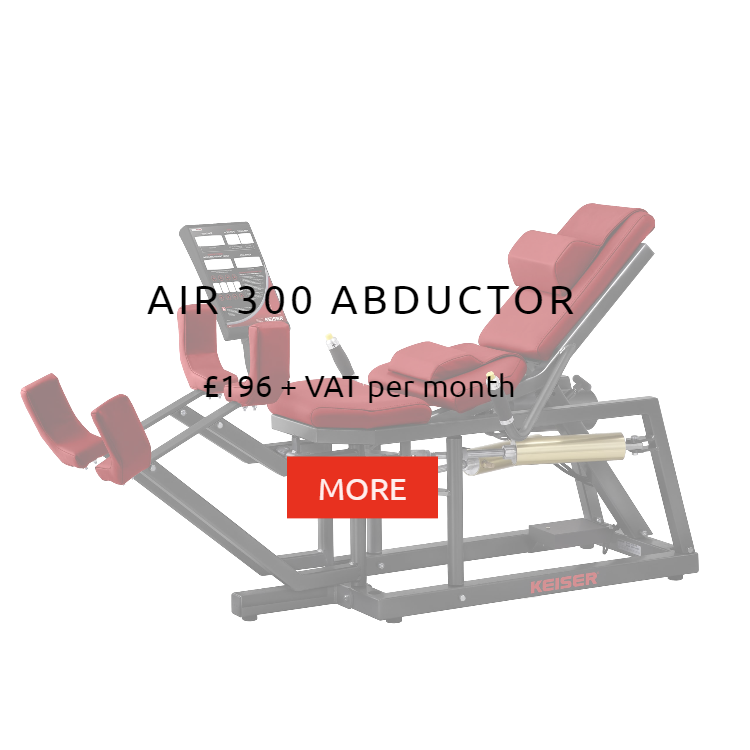 It’s time to take advantage of it. 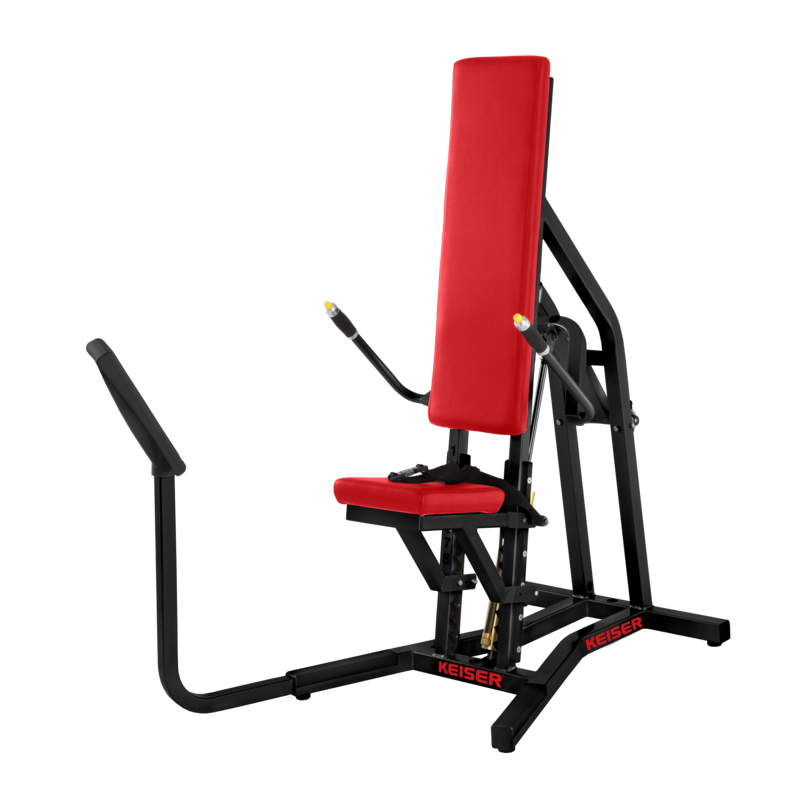 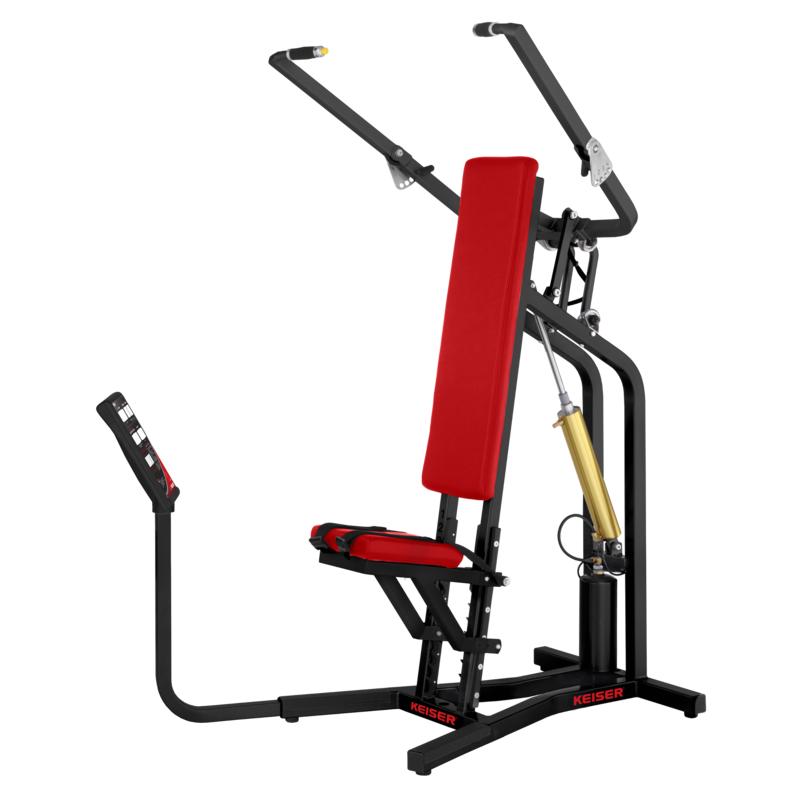 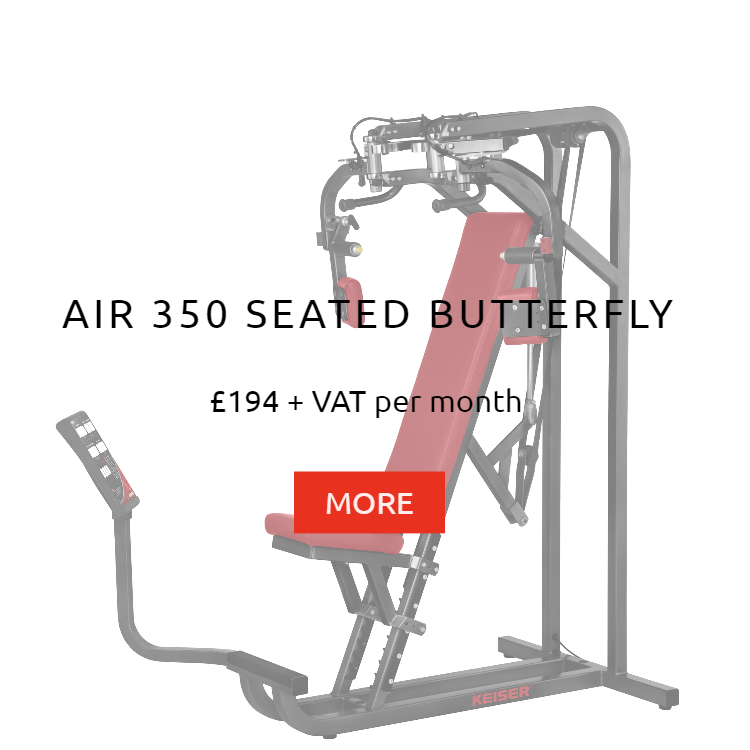 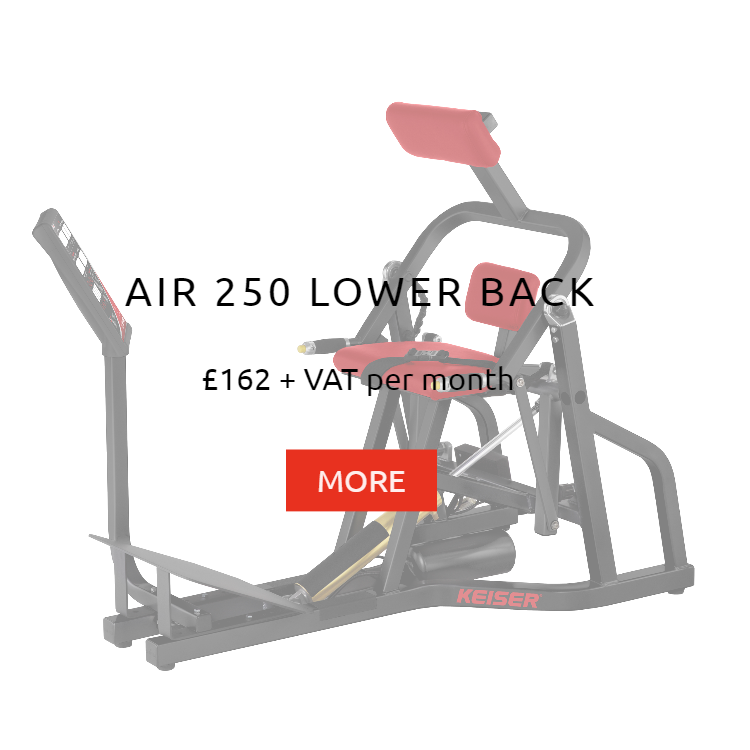 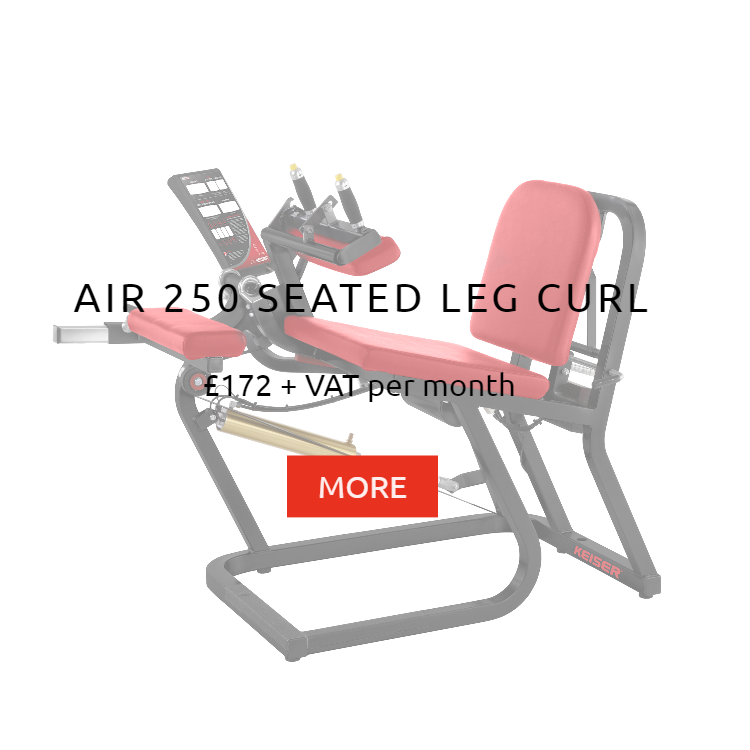 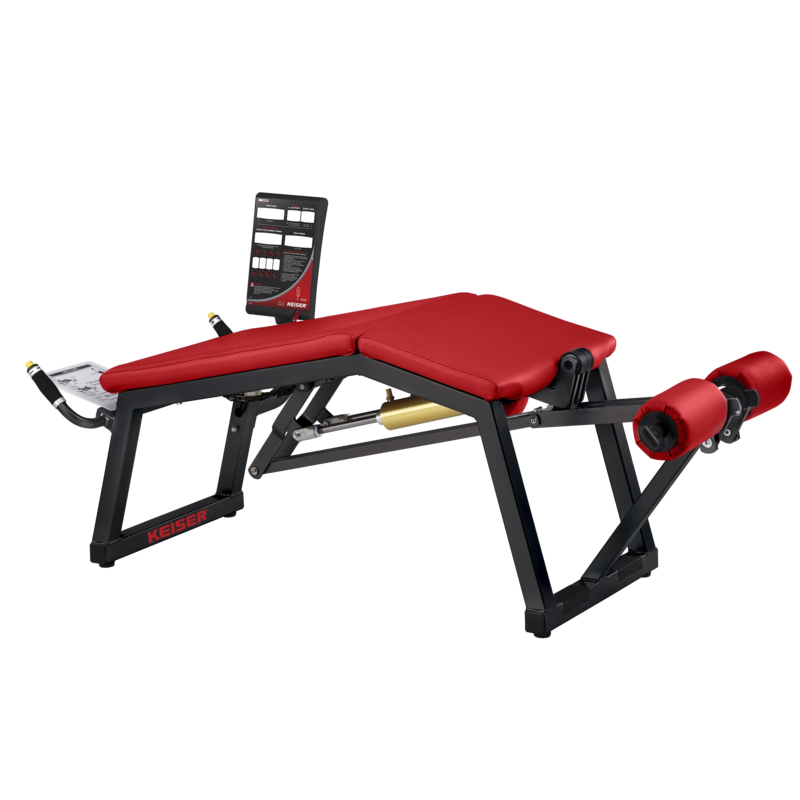 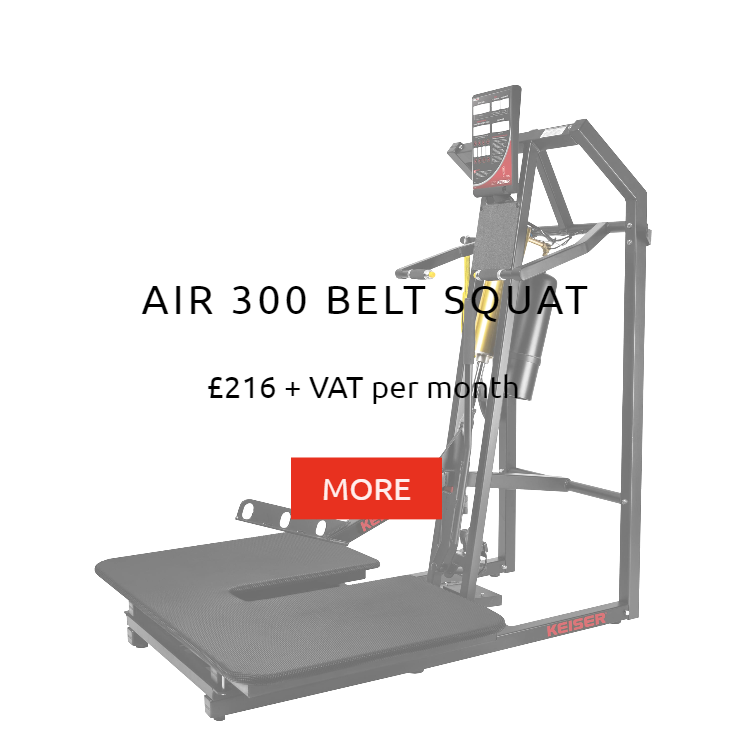 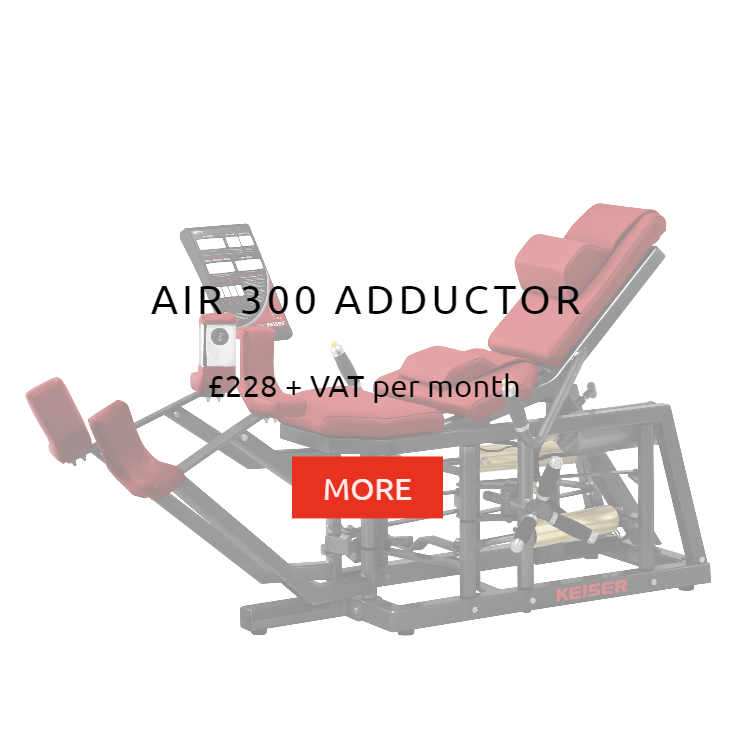 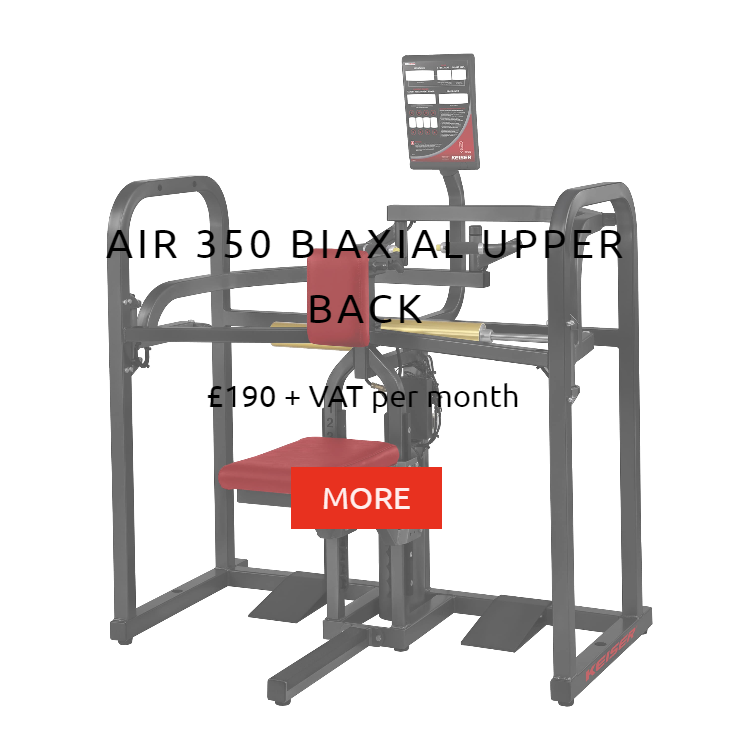 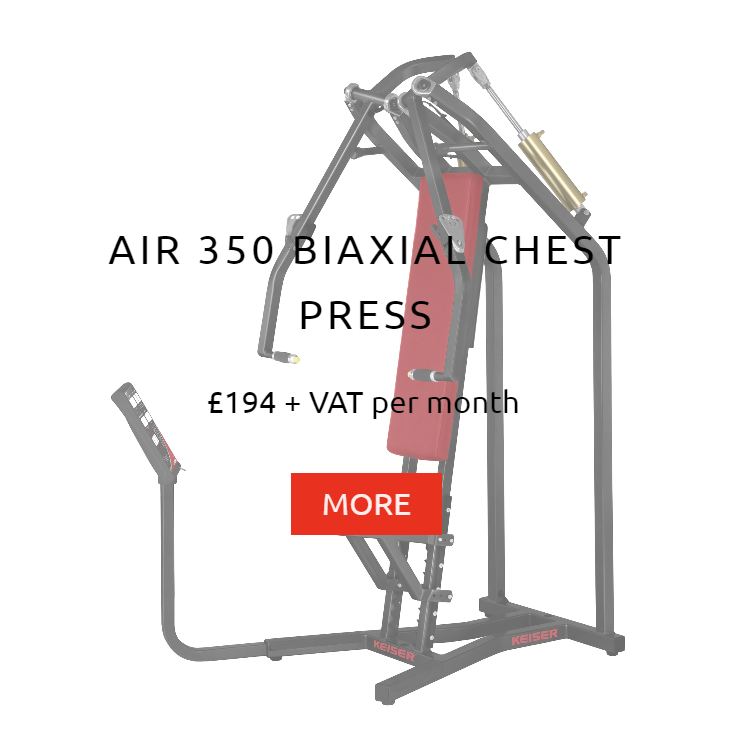 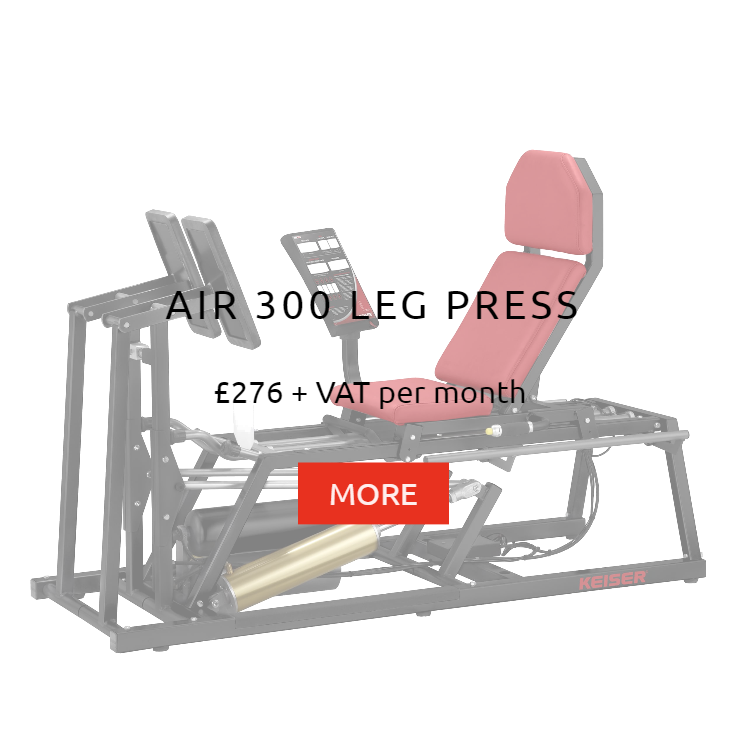 The equipment for the most desirable section of your gym is now completely affordable! 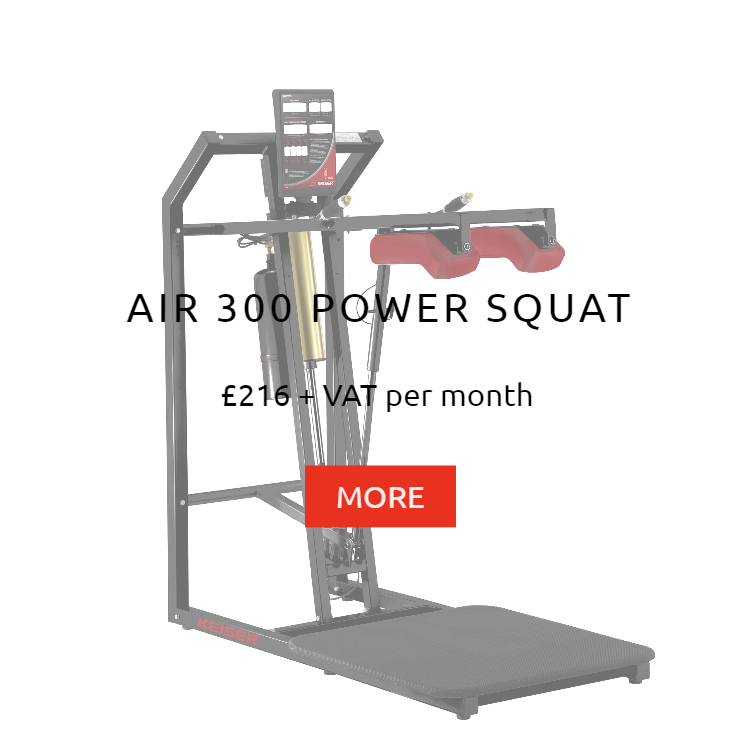 Provided stock and labour demand is permitting, we could have your new rented fitness training equipment installed in weeks! 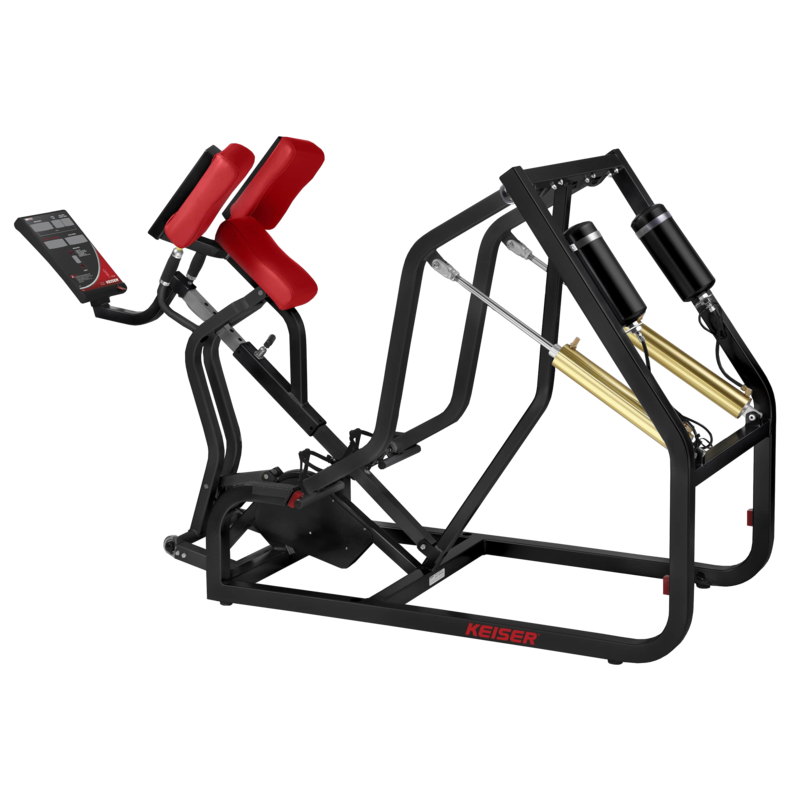 Introduce precision to your strength training programs. 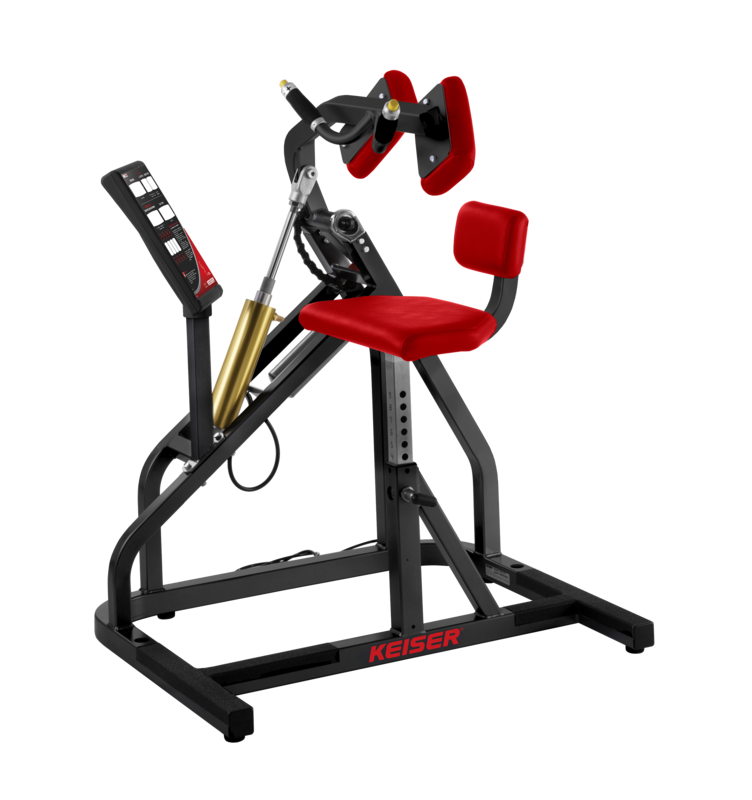 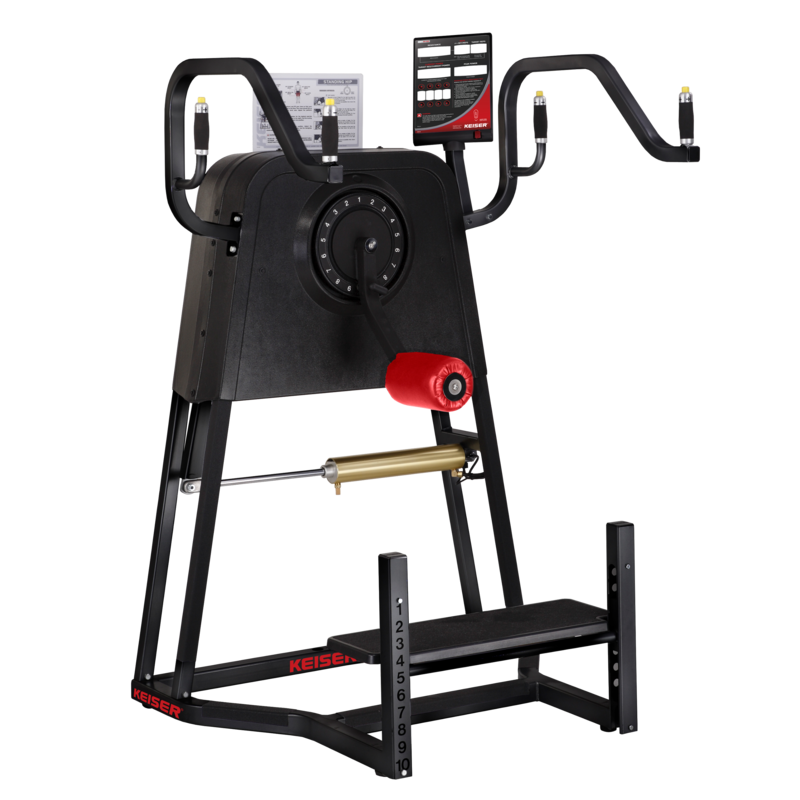 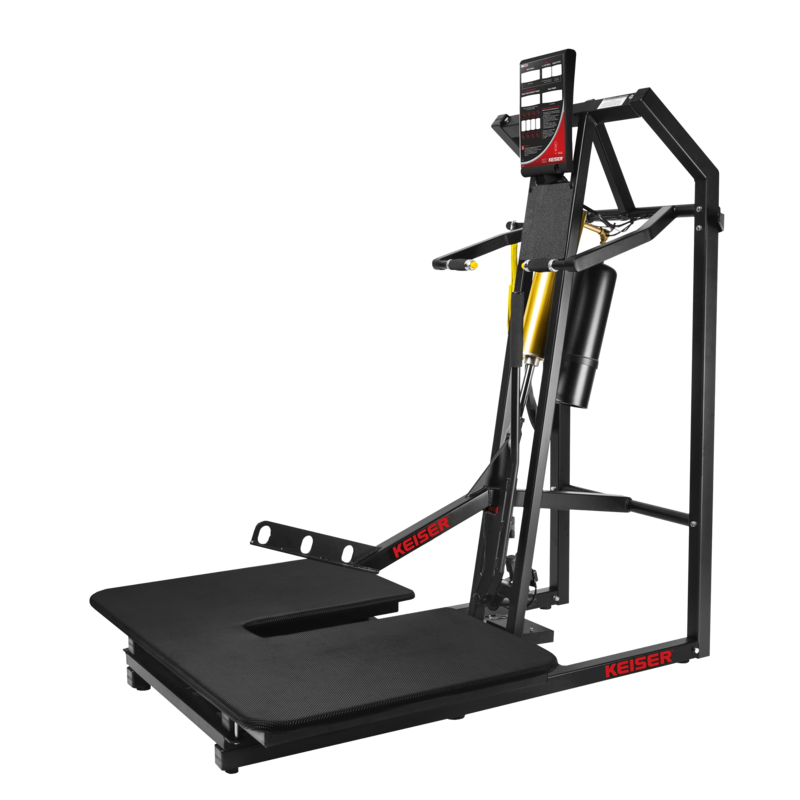 Our machines are equipped with patented Keiser pneumatic technology to give everyone from first-time gym members to pro athletes a safer, easier, more efficient way to boost power output, improve core stability, and gain overall muscle performance. 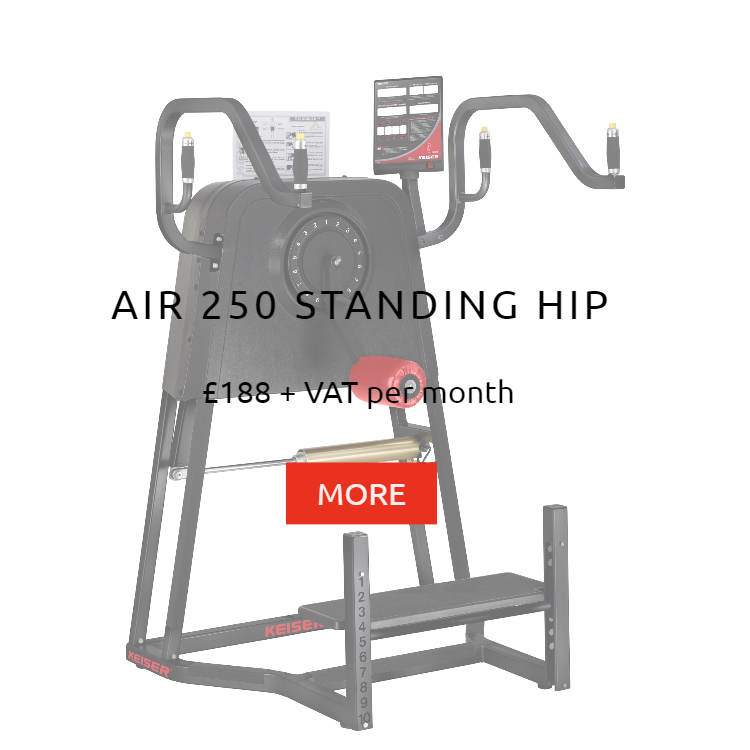 The Air 250 range is bilateral. 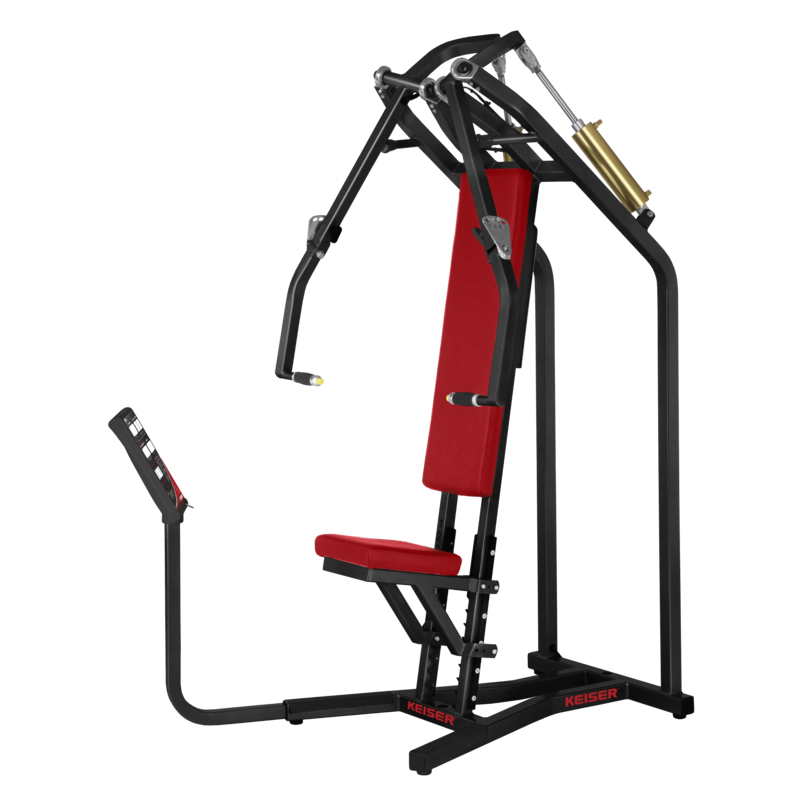 Precision resistance and Unilateral mechanics. 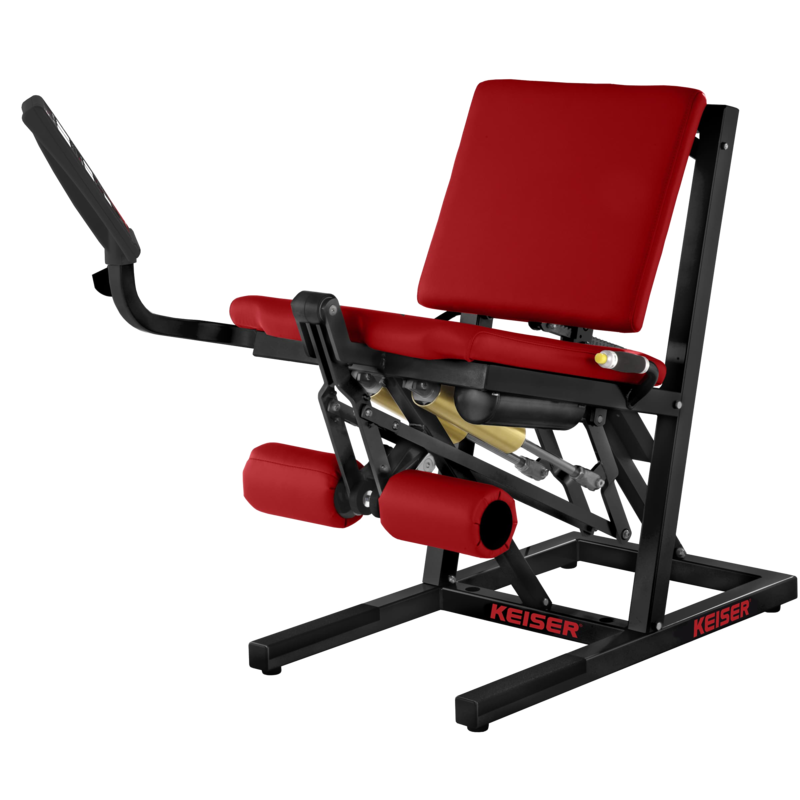 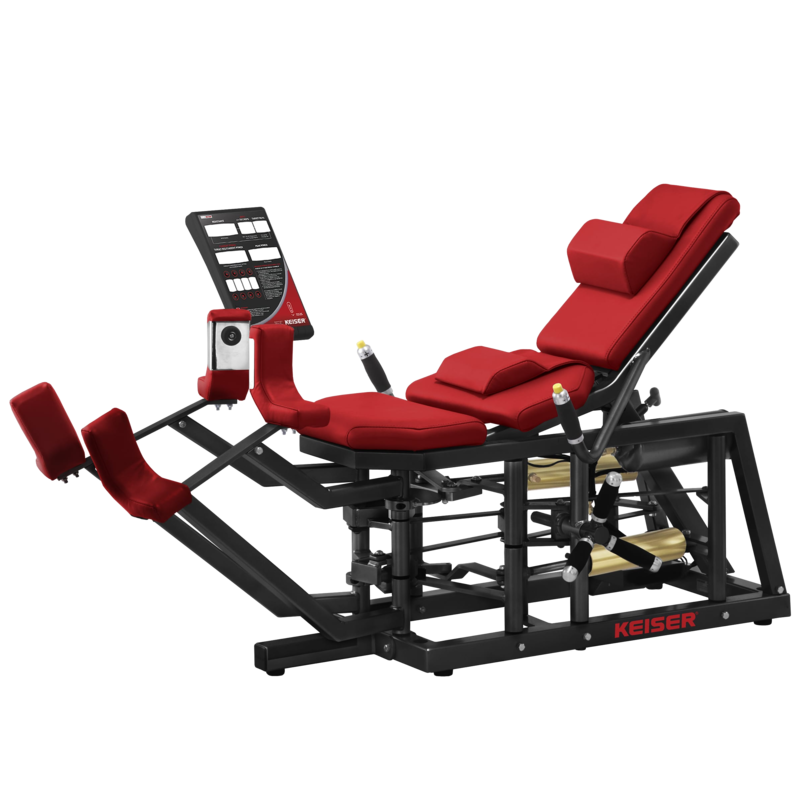 Keiser strength machines are equipped with patented Keiser pneumatic technology to give everyone from first-time gym members to pro athletes a safer, easier, more efficient way to boost power output, improve core stability, and gain overall muscle performance. 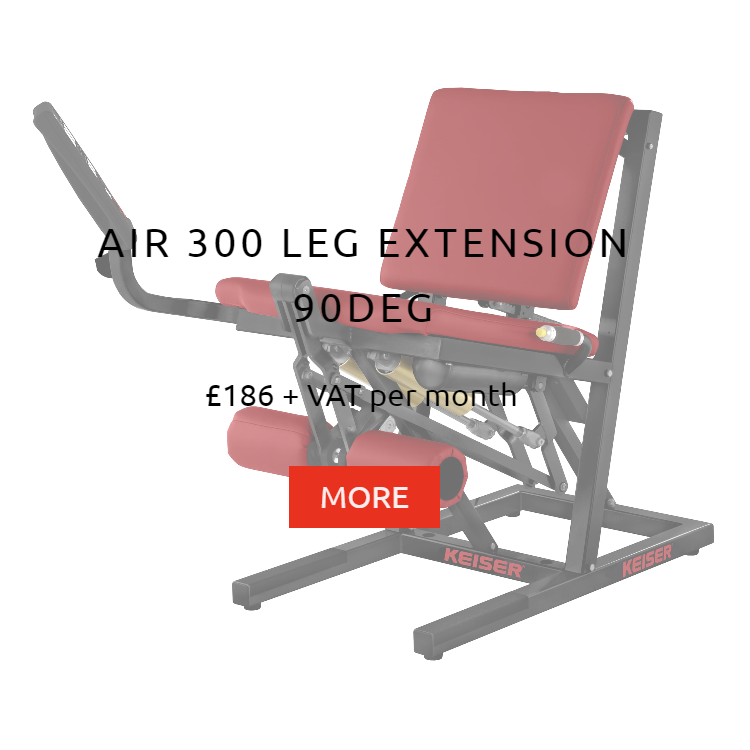 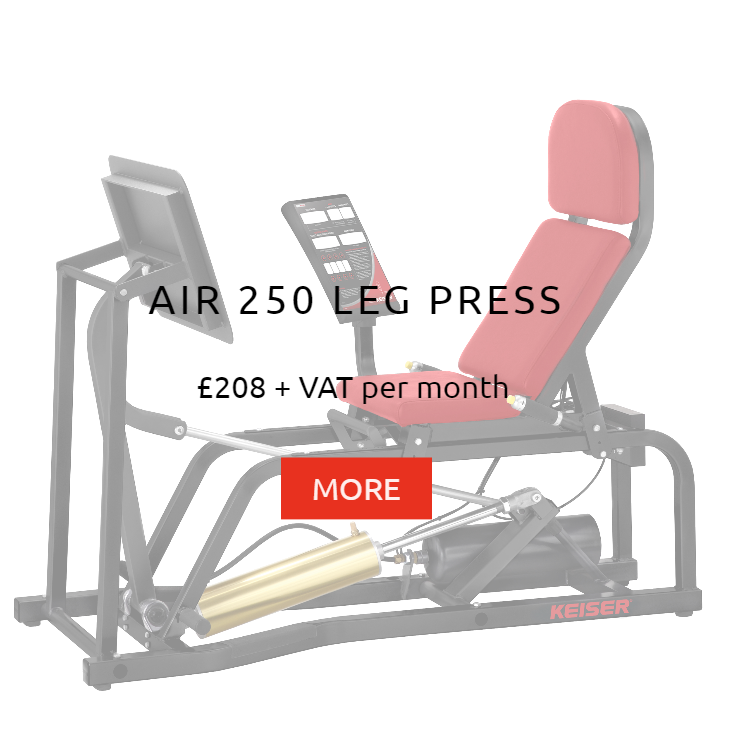 The Air 300 range is unilateral, with the design allowing for independent limb movements. 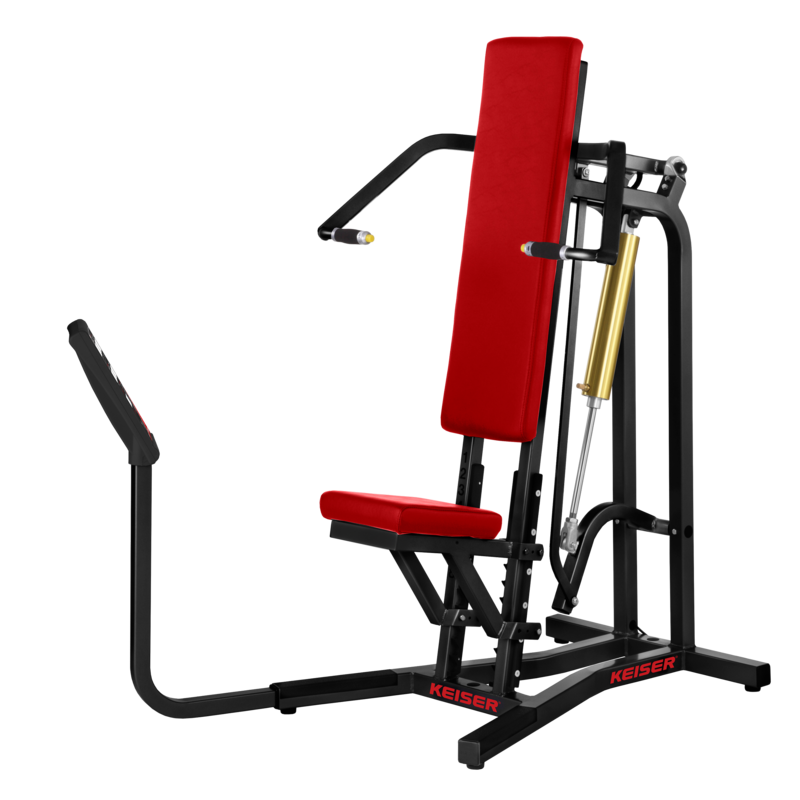 Precision resistance with converging and unilateral mechanics. 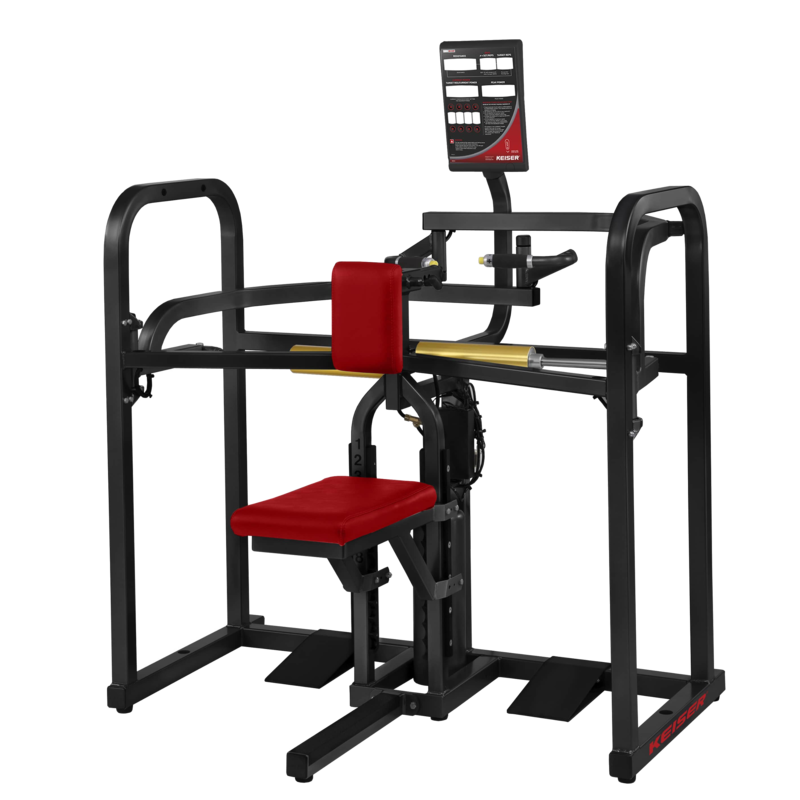 The Air 350 design allows for independent limb movements over their optimum converging range of motion. 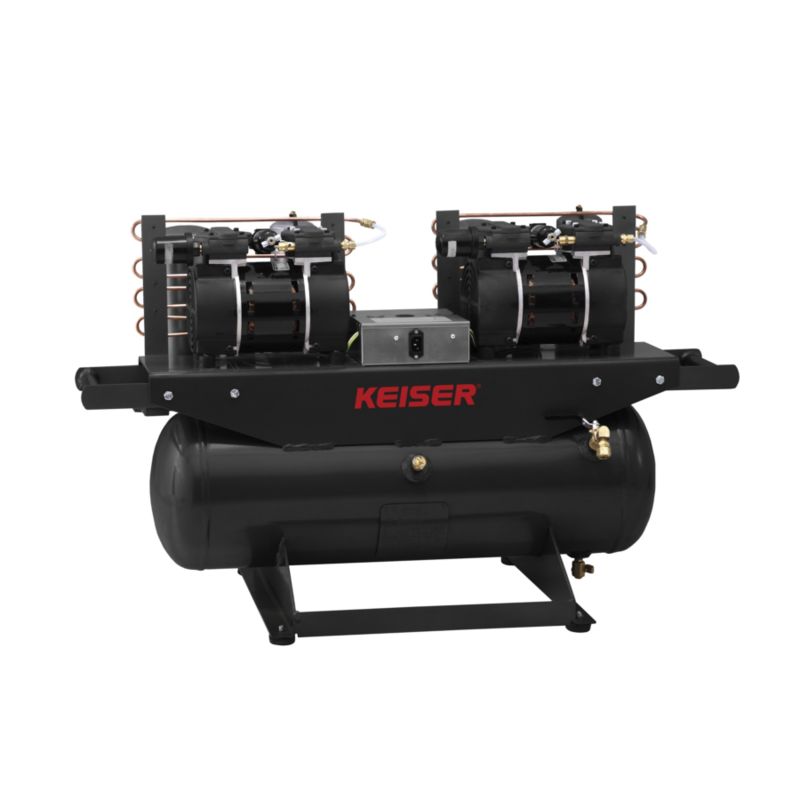 Different compressors run varying numbers of machines. 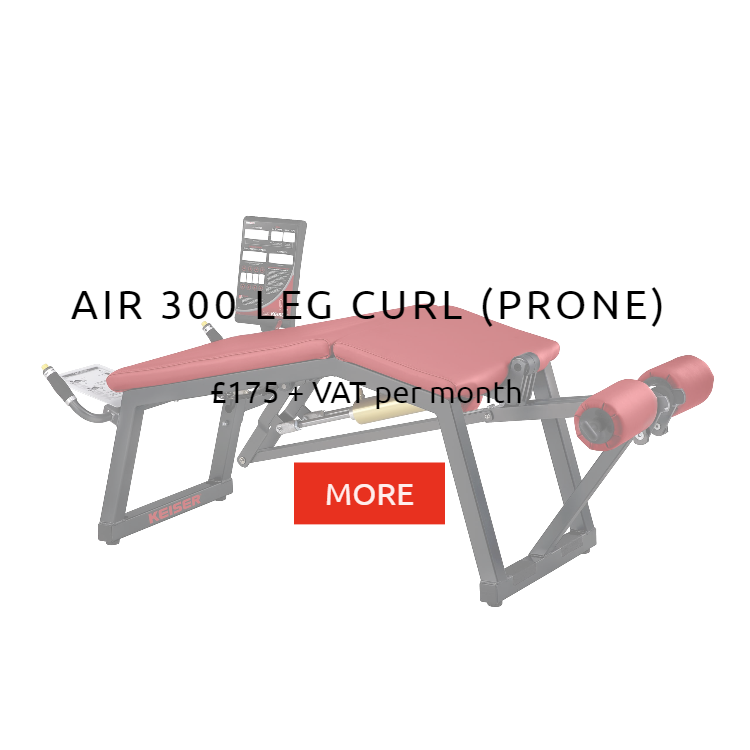 We will provide an accurate quote for your installation depending on your requirements. 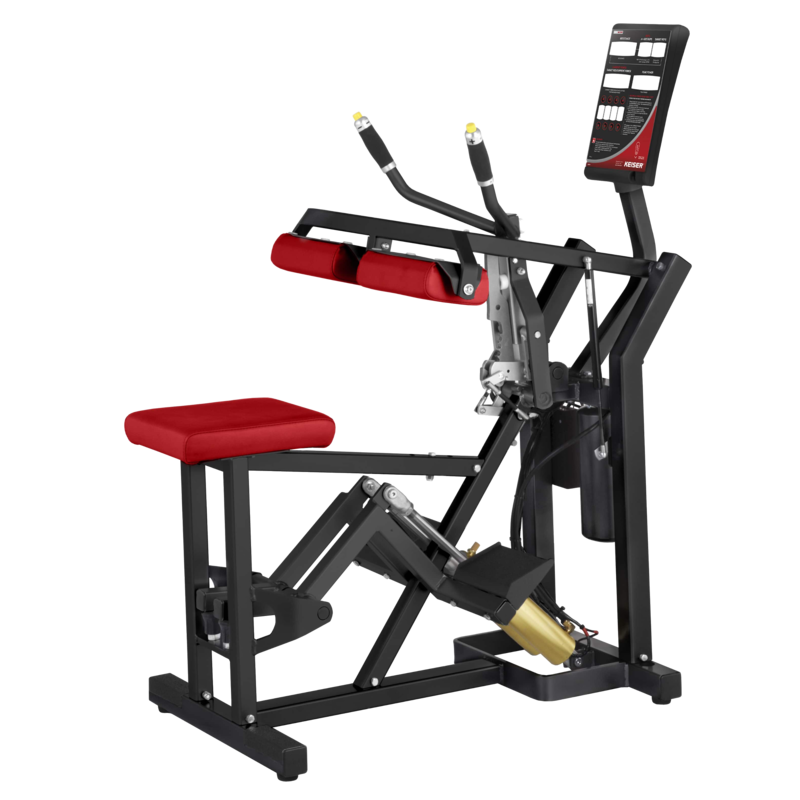 Introduce precision to your strength training programs. 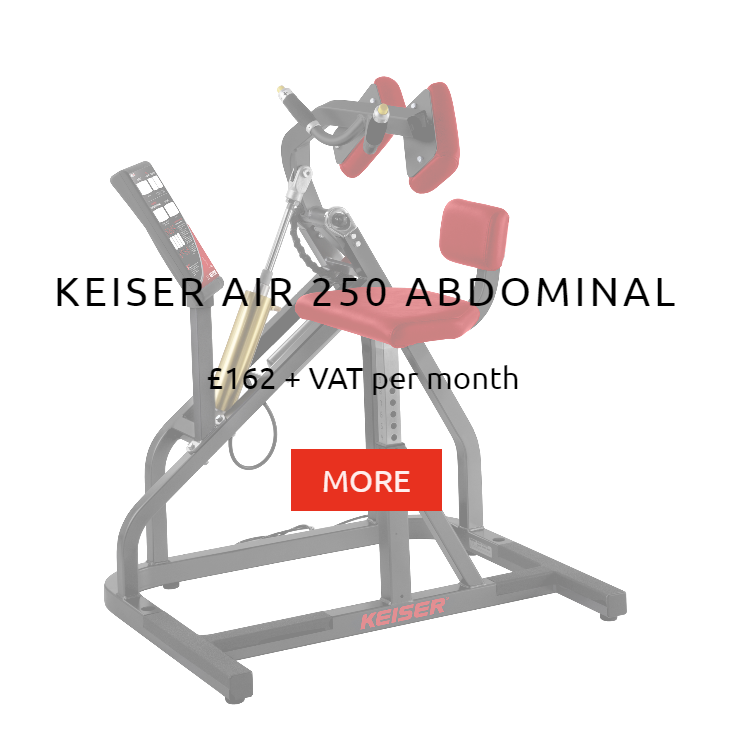 Keiser machines are equipped with patented Keiser pneumatic technology to give everyone from first-time gym members to pro athletes a safer, easier, more efficient way to boost power output, improve core stability, and gain overall muscle performance. 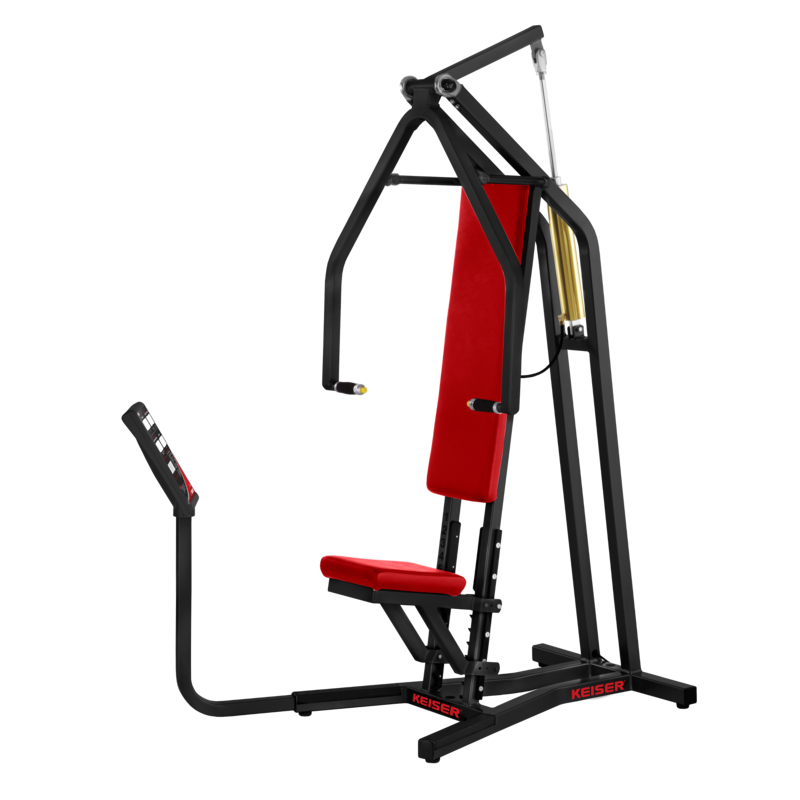 All rentals are agreed and supplied through Rent Gym Equipment Ltd.